Is the mess, the chores, the feeding, and the constant need for attention starting to get to you? It’s called burn out, and don’t worry, you aren’t alone. There are some mornings that I get up praying that the cockatoos will find it in their hearts to refrain from their dramatics for just this one day. I often don’t get my wish. Today was my day off and I had a long list of things to accomplish. As I looked over the list, I couldn’t help but notice that every item pertained to the birds except one. Guess which one didn’t get done? I got up and chopped the veggies for breakfast. I needed to set up new caging for the cockatiels. While the birds were eating, I took the cage parts to the back yard and cleaned them. While those were drying, I cleaned everyone else’s cage and washed their grates. I put the tiels’ cage up and outfitted it, requiring the use of the table saw. I decided to put the Quaker into the cockatiel’s former cage and then needed to outfit it appropriately for her. I stood back to admire my handiwork and decided that there weren’t enough toys and set about making more. When I was done cleaning and sweeping the bird room, thinking I was done in that room for the day, Linus tipped his bucket of freshly gnawed wood upside down, spilling half of it onto the floor behind the cage. This is how the day started. I was tired by noon and still had the rest of the list to get through. Some day off. Parrots are hard work, time consuming, and when you add these chores to an already busy life, it can seem overwhelming and never ending. Even though I know this is what I signed on for when I got birds, sometimes I wonder why I am doing this to myself. The answer to that question became clear enough when I heard the cockatiels joyously singing in their new cage, and when I peeked in on them, Libby, my Quaker was beating up her new toys. It was a heartwarming sight and sound, and it made me feel so much better about the day and life in general. THIS is why we do it. The cuddles, the I love you‘s, and the laughter they bring makes everything worthwhile. Why, then, is it so hard to see on some days? We have all heard about how many people get depressed around the holidays. I believe it has little to do with the holidays, and everything to do with the winter season. During the winter, the days get much shorter and we spend a lot more time indoors. With the lack of sunlight, we can be a bit deficient in vitamin D3, something which many companion birds suffer from. This can bring on depression. Try adding a D3 supplement to your diet. If you are cleaning your cages regularly, it isn’t going to harm your birds to skip it for the day. Instead, get a cup of tea, put your feet up and read a book. Even better, get your bird out and have fun with her or a have good cuddle session. 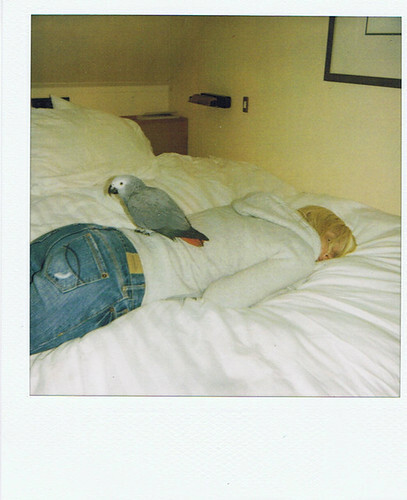 Do those things that remind of why you have a parrot in your life in the first place. It’ll do you both a world of good. Rearrange your furniture. 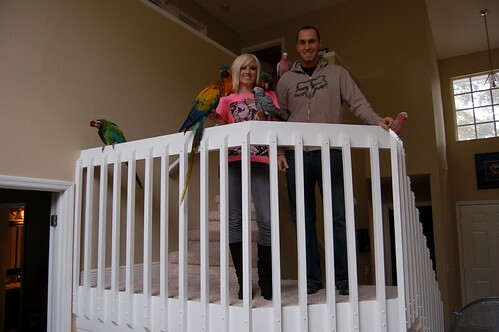 If your cage positioning doesn’t allow for this in the living room, change the bedroom. This is what I do when things are seeming too routine for me. It’s amazing how such a change can improve your outlook on life. Since you are logged onto this site, I know that your bird means a great deal to you. Recognize that your bird’s need for your attention means that you are important to him too. Birds are inquisitive by nature and need to explore everything around it. So it just happens that a naughty bird is a happy bird, and a happy bird is a healthy bird. Try to keep this thought when you’re sure you are losing your mind. Seek the support of someone who understands. 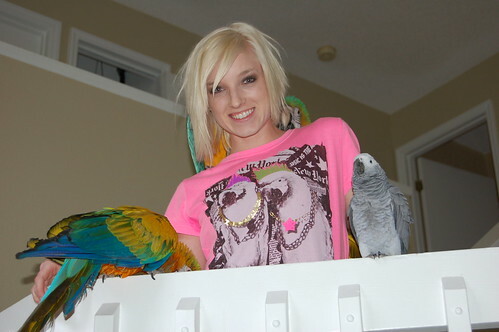 Heaven knows most people think we are crazy for going to the lengths we go to for our parrots. (You spent how much for a birdcage?? You cook for your bird??) There are a lot of us out there. Go online and find a forum to unload on. The bird store I frequented in Austin to get my supplies came to know me well. Sometimes I would go in with a bandage on my hand or a look on my face. They would say: “Uh oh. Someone’s in trouble at your house!” It helped to have someone to talk to. You might even consider a get-away for yourself, or a send-away for the birds. If you have a pet sitter or a boarding facility that you trust, sometimes a little time apart can do wonders. At the very least, treat yourself to a night out. You’ve earned it. It is okay to feel like you’ve had enough. Don’t beat yourself up or feel like a bad bird owner because it all gets to you sometimes. Just like with children, we can sometimes get to that point. Keep a cool head and maybe a little distance from the birds while you sort through it. Somehow it all magically works out in the end. Thanks Patty.. those are very helpful things you just told.